Many brides have a dream wedding in mind - the perfect dress, perfect cake and of course perfect flowers. However, the happy couple's budget can put a damper on those dreams. With our Flat Rate Wedding Service you can see up front what you get for your money - no surprises and you can be done planning in as little as one meeting. As with all our consultations, you provide the details as to wedding colors and styles and we handle the rest! Our Flat Rate Wedding packages are available in ALL budget ranges (starting at as little as $250) and each one provides full service on your special day! Please view the list below and feel free to contact us with any questions. If your wedding requires some different options than the packages listed below, just call and we can schedule a custom consultation. 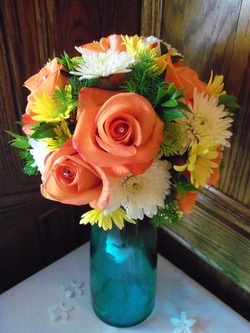 - Can add 2 more bouquets if all are mini's. May substitute each bouquet for 3 boutonnieres or 2 corsages. - Bride may pick colors/theme, bouquet style and may make flower requests but ultimate design is at Bentz Road Farm & Flower's discretion. * Package price varies based on container choice. Please call for appointment to discuss options.